To help publicize a company that makes microchips that can be implanted in humans for identification purposes, a prominent San Francisco banker got “chipped” Monday so that his living will is just a scan away if he ever becomes seriously ill.
Before some 40 investors and entrepreneurs in San Francisco, John Merriman, chairman and CEO of investment firm Merriman Curhan Ford & Co., was injected with a rice-sized radio frequency identification (RFID) tag in his upper arm. Mr. Merriman said he got “chipped” partly to support Florida-based VeriChip, saying he was “taking one for the team.” He also said he wanted the chip to enable swift access to his living will information should he became disabled. The chip was an answer to his “increasing paranoia of having the specific provisions in his living will executed” in a worst case scenario, said Mr. Merriman, who does not have any serious medical conditions. Mr. Merriman's firm is an advisor to VeriChip but the bank hasn't invested in the company, VeriChip said. The RFID market, which commonly tracks goods in a supply chain and streamlines factories, is estimated to become a multibillion-dollar industry over the next five years. 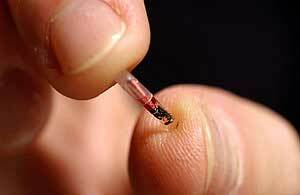 But whether or not implanting RFID tags in humans will become popular is still highly controversial. The stunt, which the company called a “live chipping,” makes Mr. Merriman only one of roughly 50 people in the United States who have received an implanted RFID tag. The tag was approved by the U.S. Food and Drug Administration last October. VeriChip, a subsidiary of Applied Digital Solutions, counts less than $1 million in revenue annually from its human implant business. The company attributes the rest of its revenue to pet ID implants and RFID-enabled medical ID bracelets. Sales from the implantable RFID are expected to grow to $5 million in 2006 and $25 million in 2007, said VeriChip CEO Scott Silverman, who also has been implanted with the company’s chip. Mr. Silverman said chipping has yet to catch on as many people aren’t aware of its benefits and others are concerned about privacy issues. “The biggest market barrier is education,” said Mr. Silverman. The company sells its chips to industries like healthcare and security. The chip is implanted right under the skin with a syringe and then can be read by a reader enabling applications in fields that require location tracking and quick identification. For example, several Mexican government officials received the chip for security purposes to combat kidnapping attempts. In a healthcare setting, hospital staff could use a patient’s RFID chip to quickly pull up the patient’s information quickly, even if the patient were unable to communicate with the caregiver. Critics say privacy concerns are a big issue for implanting RFID tags in humans because the radio signal emitted from the tag could be tracked by any unknown source. An implanted chip could potentially expose the wearer to anyone looking to use the information for harm, if the chip could unlock personal or medical information. VeriChip said its RFID tags only contain an anonymous 16-code number that can be entered into a database for applications, but which the company said is meaningless if the code is read on its own. Critics also point to the fact that millions of pets already have a similar system with implanted ID tags. As the critics see it, implanting chips in humans could lead to negative associations and might deter customers from getting chipped. But the company is no stranger to high-profile public moves. In July, Tommy Thompson, the former head of the U.S. Department of Health and Human Services, joined the company’s board to back the chip company and promote its health and security applications. VeriChip debuted its technology by chipping clubbers at a bar in Spain, enabling customers to use a bar tab by swiping their arms under an RFID reader. Last Friday, the company said it had started chipping corpses in the hurricane-affected Gulf Coast region (see Katrina Corpses Get ‘Chipped’). The company said it had implanted RFID tags into 100 corpses for the Mississippi State Department of Health, and is also in talks with Louisiana health authorities. Mr. Procter said the procedure costs $200 to tag each corpse, though the company is providing the service in the hurricane-affected areas for free. Applied Digital also began tagging pets that were found in the disaster zone to speed up the identification process.